Duckweed is a small free–floating plant with short roots. Duckweed grows on the surface of very still bodies of water. Very small and very light green color, it has 1-3 leaves, which are 1/16 to 1/8 inch in length. It is identified by having two or three leaves attached to a single root. These little leaf- root structures grow in large and very dense colonies which can cover entire ponds. Known for rapid reproduction. Oxygen depletions can occur when duckweed completely covers the water surface. 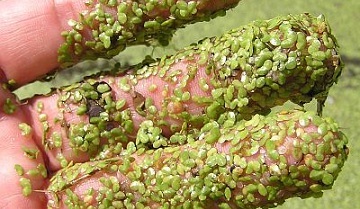 Duckweed rapidly reproduces by repeatedly cloning itself. Dibrox® and Spritflo® herbicides can be used to control duckweed. These products can be purchased on our website. Read all product labels for complete instructions before applying products.